When you think you can’t do it, or life is too hard, think about our little group of friends in Arizona. Believe me, we’re not just a bunch of happy-go-lucky ladies, living in the desert, with nothing better to do than to ride our horses and eat bon-bons. Each of us has our own story, our own battles, and ultimately, our own triumphs. Our common thread is our love of horses, and our determination to KEEP going, despite any negative that decides to slow us down a little. It’s not that we think we’re extraordinary, we’re just friends who really admire each other and face our setbacks with empathy, support, a good sense of humor and with our love of horses as a cementing bond. Going to feature our little gang of Old Gray Mares & hope their stories will encourage others to stay in the saddle. Would love to hear YOUR stories too – drop us an email. 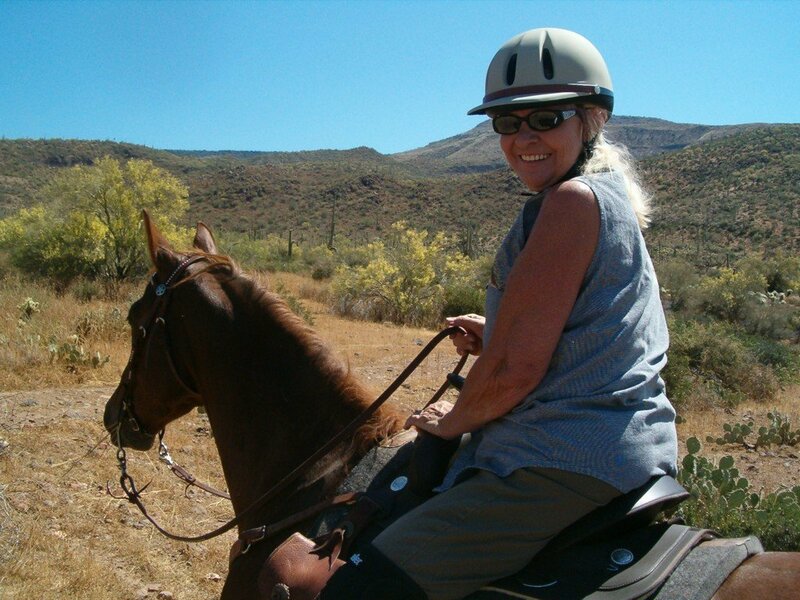 Gail moved to New River in 2004 from Hesperia, CA and no stranger to desert living. She brought her dear mare Pepper with her & her husband rides a rascal named Starbuck. She also brought Cato, an Appendix gelding. 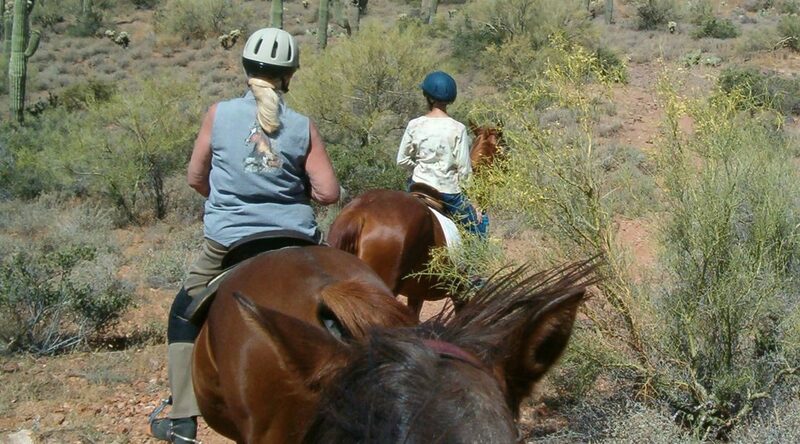 Gail rode Pepper and we noticed that she limped a little – Gail, not Pepper – but tossed off any suggestion that something was wrong. Until the fateful ride that brought her to tears, such was the intensity of the pain in her hip. After MUCH exploration to find help, Gail underwent hip replacement surgery. She seemed to breeze through the recovery, commenting that the post operative pain was SO much less than the pain in her hip before the surgery. One would never imagine that she was suffering that much because she never complained about a thing. The question was, could she ride again? The doctors didn’t say she couldn’t, but they were cautious. And since riding had become so physically painful, Gail wasn’t sure that riding needed to be a priority in her life. In addition, Pepper had aged to the point that she needed to be retired from riding. Then Dayla came into Gail’s life. Gail was NOT looking for a quarter horse, definitely NOT a mare, let alone a very young and very TALL mount. And Paul, her husband, didn’t think they needed a 4th horse in their barn either. But Dayla needed a good home and her former owner felt that Gail was it.